The deal calls for the school to pay $425 million to the 332 victims represented in current litigation, with another $75 million set aside in a trust fund which could go to future plaintiffs who allege they were abused by Nassar, the attorneys said in a joint statement. Sexual abuse victims of disgraced gymnastics Dr. Larry Nassar and MichiganStateUniversity have reached a tentative settlement in which the university will pay the victims $500 million, attorneys for both sides said on Wednesday. 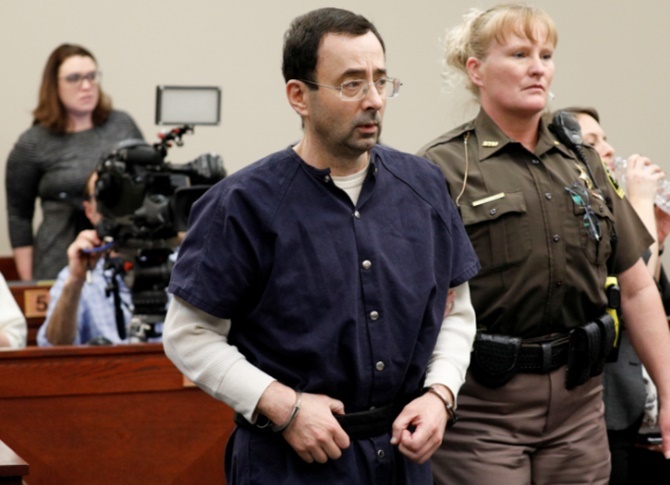 Nassar, who had worked as a doctor for the USA Gymnastics federation and also served at an on-campus clinic at MichiganState, earlier this year received two prison sentences of up to 125 years and up to 175 years after hundreds of young women testified about decades of sexual abuse at his hands. "This historic settlement came about through the bravery of more than 300 women and girls who had the courage to stand up and refuse to be silenced," plaintiffs' attorney John Manly said. "MichiganState is pleased that we have been able to agree in principle on a settlement that is fair to the survivors of Nassar's crimes," said Robert Young, special counsel to the university. The attorneys stressed that the settlement, which was agreed to by the university's board of trustees in a conference call on Tuesday night, is still not final. It applies only to plaintiffs who have sued the university, and not those who have filed claims against the US Olympic Committee, USA Gymnastics, gymnastics coaches Bela and Martha Karolyi or any other parties, the attorneys said.